Feel beautiful inside and out. Hey now! Hope everyone is enjoying their week. I've been all wrapped up in swatching and rooting for the Cubs in the postseason. It's so exciting this year! Anyway, today's challenge is french tips. I was at a loss as to what to do for these. I typically don't wear french tips. I'm not really a big fan of them. I didn't have the right shade of green that I wanted to use, so OPI Color Paints to the rescue! 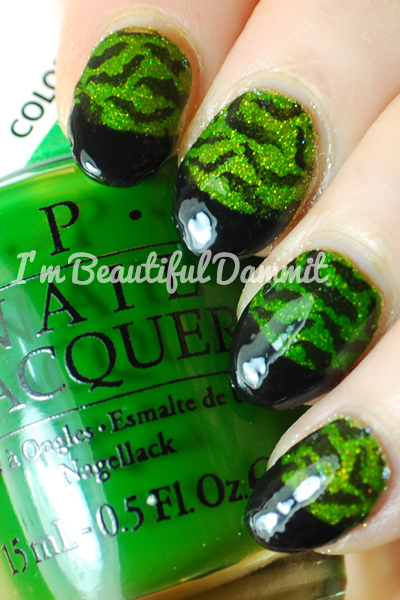 Again, I got to try out another stamping plate I hadn't used before. I think next time, I would like to do this mani without the tips. I think it looks better that way. Nicole by OPI - Make a Comet-ment for the holo base. OPI - Landscape Artist over the base. Sally Hansen - Black to Black for the bats and tips.